In a year when #metoo, gender pay inequality and the feminist agenda has rarely been out of the headlines, 2018 is an especially appropriate time for Gracefool Collective to tour their powerfully satirical Edinburgh hit This Really Is Too Much, and the tour opens at Newcastle’s Northern Stage on Wednesday 26 September. Raucous, provocative and laugh-out-loud funny, the four-piece have created a genre-busting show that reveals the downright absurd realities of life as a three-dimensional, high definition, water-drinking, salad-eating, moisturising W.O.M.A.N. in modern society. 'Gleefully compelling' (Exeunt), slickly choreographed and dripping with feminist charm and anarchic wit, This Really Is Too Much combines dance, dark comedy and theatre. An accessible and humorous exploration of gender inequalities the show delves deeply into a world of farcical stereotypes and preposterous power struggles, wrestling with gender, identity and social convention along the way. After 100 years of women’s suffrage in Britain how far have we really come in that time? This Really Is Too Much is an outlandish, thought-provoking and wildly entertaining medley of absurd political speeches, talent contests, job interviews and box ticking. 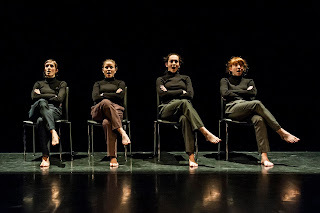 The four performers, Kate Cox, Sofia Edstrand, Rachel Fullegar and Rebecca Holmberg, fight themselves, each other and society’s expectations for women to be individual, political, beautiful, popular and in control – and in their place. Kate said ‘Our aim is not to point fingers’. ‘But to shine light on some of the ridiculous scenarios we observe in real life’ added Sofia ‘and to challenge how easily we accept these’ concluded Rebecca. The four Gracefool’s (collectively) say that ‘This show is for anyone interested in dance, theatre, laughing, crying, feminism, gender, identity, smashing the system, ticking the boxes, beauty pageants, political speeches, salad, moisturiser, water, turtle necks, disco, Steely Dan and/or Barry White’. This Really is Too Much is supported through funding via CATAPULT (Llankelly Chase, Northern School of Contemporary Dance, Spin Arts and Yorkshire Dance), Northern Connections (Northern School of Contemporary Dance), CARP (Barnsley Civic), Dragon's Den (OneDanceUK) and Activate Performing Arts. Powerfully satirical and wildly entertaining genre busting theatre/dance/comedy exploring gender inequalities, farcical stereotypes and preposterous power struggles.